Company: Cryptoheros sp. 'honduran red point' (Blue Convict cichlid) is best kept with other medium sized cichlid from Central America or in a community aquarium with other species with similar demands and behavior. Aquarium setup: Cryptoheros sp. 'honduran red point' (Blue Convict cichlid) is best kept in a planted aquarium with some floating plants and open areas to swim on. The aquarium should be decorated to offer a lot of hiding places among rocks. Feeding: Cryptoheros sp. 'honduran red point' (Blue Convict cichlid) accepts most food sources but a diverse diet is essential for this species to retain its colors. Breeding: Cryptoheros sp. 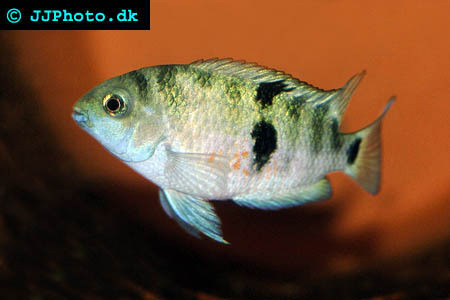 'honduran red point' (Blue Convicts cichlid) is to breed although not as easy as the black convict cichlid. The eggs are laid on a flat surface. The female is in charge of guarding the eggs while the male guards the breeding territory.